Michelle Bachelet, President of Chile speaks during Special Session of the Human Rights Council. 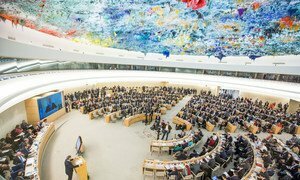 Addressing a special meeting of the United Nations Human Rights Council, Chilean President today stressed the importance of multilateralism and the work of the 47-member body. “I raise my voice in support of the efficacy of the United Nations and the Human Rights Council,” said Michelle Bachelet, stressing the need for the UN to increase a regular budget allocation to the human rights agenda from the current three per cent. “In my opinion, it is important to preserve the essence of the Council and to prevent it from being used for alternative purposes by any one State. We are all responsible for ensuring that the international system works as it is supposed to,” she said. “One fundamental element is the principle of adherence to international law, which includes respect for treaties and preventing the misuse of mechanisms or institutions designed to resolve differences,” she added. Chile has resisted dictatorship and has taken charge of the burdensome legacy of brutal human rights violations, she said. Among other things, Chile has made a commitment to head an initiative against torture to prevent this crime from occurring and promote ratification of international instruments related to the issue, said Ms. Bachelet. After having received numerous recommendations, Chile in November 2016 modified the Penal Code that defined the crime of torture according to three categories: physical, psychological and sexual violence. The Government is also working on efforts to present a bill that would create a national preventative mechanism against torture within the national human rights institution. In his video message, the UN High Commissioner for Human Rights, Zeid Ra'ad Al Hussein, said that Chile has long been a strong human rights advocate at the international stage. Chile has made great strides since the end of the dictatorship, but too many families still do not know the truth about what happened to their loved ones. The right to truth for victims of gross human rights violations is inalienable. Any potential measure of pardon or early release for perpetrators must be carefully considered in light of human rights law, he said. At respective interactive dialogues today on the Democratic People’s Republic of Korea, Myanmar, Burundi, Iran and Eretria, senior United Nations independent human rights experts called on the governments to take immediate steps to ensure human rights protection in their respective countries.